While searching on Züricher (and its variant Zürcher), as part of a look at men named Peter Zwicky in the Zürich area, I came across Züricher Geschnetzeltes, a characteristic Swiss dish that I did not experience as a child, but in fact first encountered at a little restaurant on Limmatstraße in Zürich — in September 1972, almost 46 years ago. 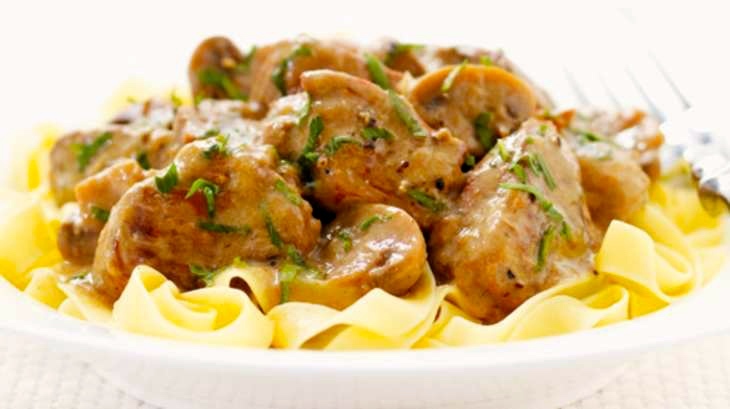 A very simple veal dish, served on freshly made noodles, but absolutely perfect: melt-in-the-mouth strips of veal in a sauce that was both brown and creamy, elegant yet intense. Julienned carrots sauteed in butter. A crispy white wine. A plain green salad. Zürcher Geschnetzeltes (German for “sliced meat Zurich style”, Züri-Gschnätzlets in Zürich German, émincé de veau zurichoise in French) is a Swiss dish from the Zurich region. The veal and kidney are cut into small thin strips. The meat is sautéed quickly in a very hot pan with a little butter and a bit of chopped onion. Then the meat is taken out of the pan and kept warm. White wine is added to the same pan with cream and demiglace and reduced into a sauce. The meat is added to the hot but not boiling reduction. Sliced mushrooms are added. Finally, the dish is garnished with pepper, salt, paprika powder and lemon juice. 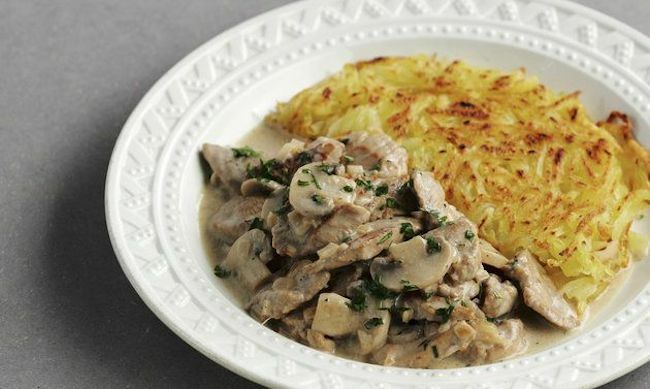 When Ann (Daingerfield Zwicky) and I had it back in 1972, we recognized it as a first cousin of beef Stroganoff — and also as a dish that could be made quickly and easily. On to émincé de veau ‘thin slices of veal’, which can be an extremely simple, as in a recipe on Pierre Franey’s New York Times food site for “Emince de Veau a la Suisse (Sauteed cubed veal in cream)” — the site seems to eschew diacritics — seasoned with parsley, shallots, tarragon, and chives, but without mushrooms or kidneys. The recipe, from Franey’s recipe from 60 Minute Gourmet is said to take only 20 minutes in preparation. As you can see, there’s plenty of variation in the details. 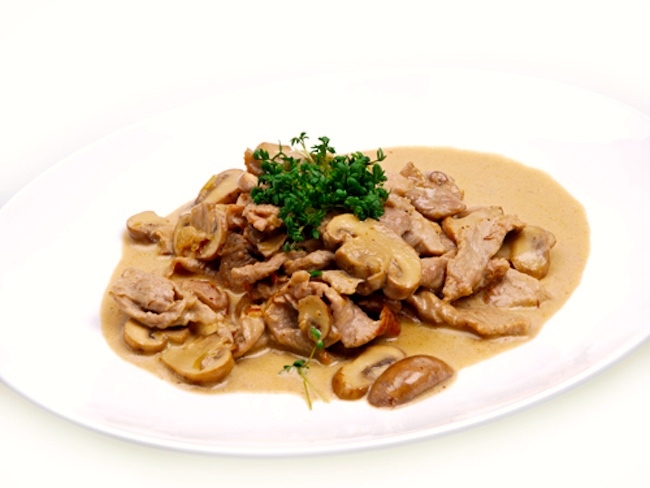 There are curried versions of Geschnetzeltes / émincé de veau, versions with mustard (moving the dish closer to beef Stroganoff), very white and creamy versions, some using brandy instead of white wine, etc. This entry was posted on June 27, 2018 at 8:08 pm and is filed under French, German, Language and food, My life. You can follow any responses to this entry through the RSS 2.0 feed. You can leave a response, or trackback from your own site.